Not as fast as you can in a quarter mile, just as fast as you can. Now in its 20th year, Speed Week, held at Lake Gairdner, South Oz by the Dry Lakes Racers Australia, is one of the last bastions of old-fashioned motorsport, where ingenuity and comradely behaviour count for more than the dollars in your wallet. Racers run flat out over a nine mile course, with the aim of setting class records or simply achieving some personal milestone. 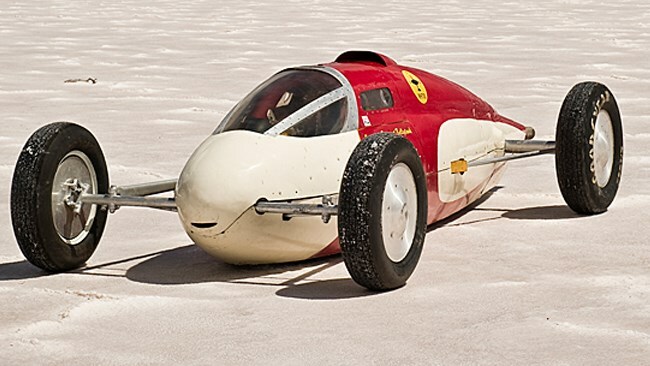 The quickest vehicle this year was John Lynch's bellytank, which ran 258mph. Equally impressive are the guys running super-quick in decidedly un-aerodynamic 60s muscle cars – such as Wayne Pickles HK Monaro, which pulled 217mph – that is damn close to 350km/h! Jason and Vince turn up the boost and run nines in the Scorpion!